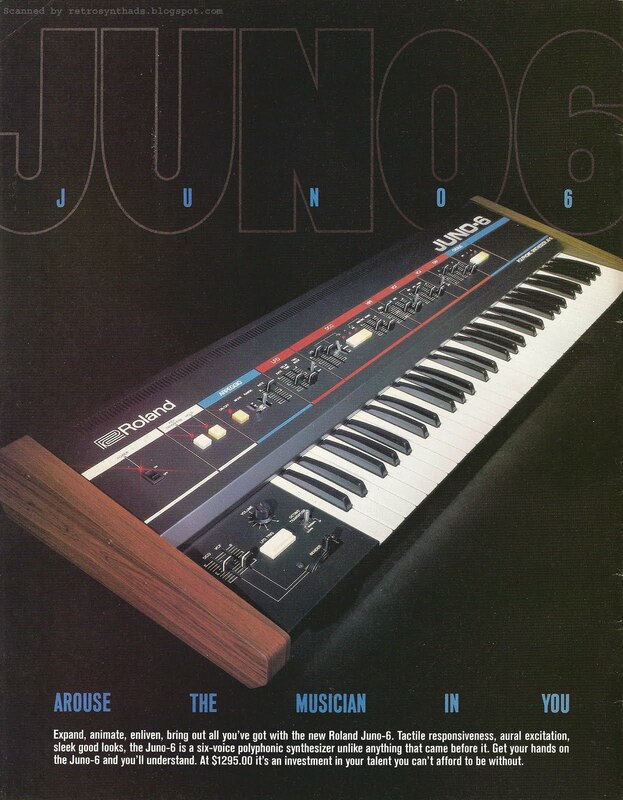 Roland Juno-6 synthesizer advertisement from the front-inside cover of Keyboard Magazine July 1982. This advertisement ran in Keyboard magazine during mid-1982, pretty much as this TB-303/TR-606 ad was winding down. I especially enjoy the photo of the Juno-6 with it's subtle pre-Photoshop lens-flare effect that can be seen above the first four led lights. I also enjoy this photo because it was the beginning of a Juno-based color scheme that would be carried on to grace the front panel of my favorite Juno-series synthesizer - the Juno-106. Whenever I think of the Juno-6, I think 'DCO' - digitally controlled oscillators. More to the point, I think back to the 'glory days' of the Internet and the number of questions, statements, comments, quotes, feelings, outbursts, and unsubstantiated criticisms about Roland's DCOs that took place in music stores, on stage, in back alleys, on rec.music.synth, and in mailing lists like Analogue Heaven. I did a quick Google search on Roland's DCOs so that I could explain to readers exactly what they are, and found a great technical write-up on the subject by Tom Wiltshire on electricdruid.net. His page explains Roland's Juno Series DCOs in a way that even *I* can understand. I couldn't stop reading! Basically, the Roland DCO is "an interesting hybrid design" that "although digitally controlled and digitally stable, the oscillator produces a true analogue output". Oscillators always start a note at the same phase. "Still, this technique provides true analogue waveforms and digital stability and tuning, without any of the aliasing issues that come with digital oscillators. This surely makes it a valid approach. Rather than use the 8253, a modern solution might be to implement a similar system using the 16-bit timers on a microcontroller like the AVRs or PIC series." One issue before this advertisement appeared in Keyboard - June 1982, Roland announced the Juno-6 in the Spec Sheet section. "The Roland Juno-6 is a six-voice polyphonic synthesizer with a digitally controlled oscillator circuit for greater stability, an arpeggiator with rate and mode controls, and a digitally controlled key transposer. Control features in the DCO section include variable pulse, sawtooth, and square wave sub-oscillators (all of which can be combine with one another), LFO modulation, PWM modulation, a selector for manual, envelope, or pulse width modulation, and a noise generator. In the LFO section, features include rate and delay time sliders and a trigger mode selector. The VCF section includes a high pass filter and a 24dB/octave lowpass filter with cutoff frequency and resonance controls, envelope modulation amount slider with an inversion switch, and other features. A two-mode chorus generator thickens the sound to two different degrees of intensity, which may be combined to produce vibrato or, when using the stereo outputs, stereo panning. Price is $1,295.00. Roland, 1022 S. La Cienega Blvd., Los Angeles, CA 90035." BTW - the June 1982 issue of Keyboard is one of my favorites. The feature article that month was 'The New Synthesizer Rock' and featured pages and pages of phone interviews with Martin Gore of Depeche Mode, Layne Rico and Scott Simon of Our Daughters Wedding, Scott Ryser and Rachel Webber of the Units, David Ball of Soft Cell, Richard Barbieri of Japan, Chas Gray and Stan Ridgeway of Wall Of Voodoo, and Peter Principle of Tuxedomoon. Just for the heck of it, I did a Google search and (sure enough) found the article transcribed online at synthpunk.org. Excellent post. I really like your website. I get a jolt of nostalgia from your posts -- especially this one as the Juno-6 was my first synth, way back when. It's great to see so many wonderful instruments reconsidered and placed into historical perspective. Thank you for the great work, please keep it up!